Wildfire ripped through this area of forest, which was infested with Sudden Oak Death. Does infestation with SOD make wildfires burn with more intensity? Photo: Kerri Frangioso. From Oregon to Big Sur, potentially millions of trees have been killed by Sudden Oak Death, or SOD. In 2006 and 2007, researchers from UC Davis set up a large-scale study in the coastal forests near Big Sur to examine the spread of the disease and its impact on forest dynamics. The area was one of the first to be affected by SOD. Members of the Rizzo Lab at UC Davis had established 280 plots across the region, carefully counting and measuring each tree and checking for SOD infection. 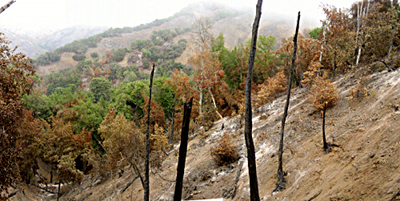 Then, in June 2008, the Basin Complex Fire ripped through Big Sur, burning over 95,000 hectares of forest. By the time the fire was contained, over a month after it began, one third of the team’s plots were crisp and blackened. While the fire burned, news media and firefighters assumed that areas of the forest infested with SOD would burn more intensely—all the dead oak trees would fuel the fire. But the natural experiment created by the overlap of the Basin Complex Fire and the UC Davis study allowed researchers to test whether SOD did in fact make wildfire worse. Their study will soon be published in the journal Ecological Applications; a preprint of their paper is available here. What they found was not what the news media or the firefighters predicted. Andrew Molera State Park, the same plot as the top photo, before the Basin Complex Fire. Photo: Kerri Frangioso. 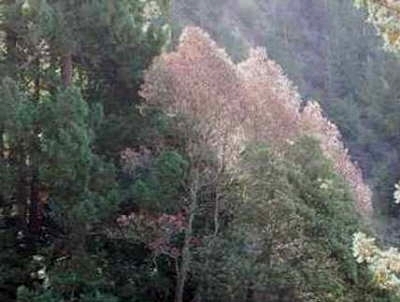 Sudden Oak Death came to California in the 1990s, probably on the leaves of a rhododendron shipped in for the nursery industry. The disease is caused by a water mold, called Phytophthora ramorum. It can spread short distances in splashes of water, and can potentially travel longer distances when water is blown about in storms. Not all trees that are infected with the pathogen will die. Some species, like California Bay Laurel, do just fine. But California Bay is like Typhoid Mary—it serves as a host to the pathogen and allows it to spread to other, more susceptible species. The pathogen is fatal to tanoak and several species of oak trees. These species develop cankers on their trunks, which bleed out a thick, red liquid. Slowly, the bark around the entire circumference of the tree is affected; all tissue above this girdle dies, leading to the death of the tree. In 2008, Margaret Metz had just begun a new post-doc in Dave Rizzo’s lab. She was to work on the Big Sur project and analyze the data from the 280 plots to understand SOD impacts in the region. Her colleagues had spent months setting up the plots for their SOD study. They knew the size and location of every tree, whether it was standing upright and healthy (or newly infested with SOD), or whether it was dead and decomposing on the ground. When Metz found out her study site was burning, she was devastated. All that hard work—and all those trees—was going up in flames. However, the dismay was short-lived. The team had a perfect pre-fire dataset. They just needed to census the plots after the fire, to get a rare comparison of the severity of fire in areas with and without SOD. This was an experiment they didn’t intend on doing—but drought and a dry lightning strike had made it possible. Dave Rizzo was able to quickly procure funding for the researchers to re-census the plots. “You could never do a controlled burn on that scale,” says Metz. Where there’s SOD, there’s more intense fire? News articles about the Basin Complex fire linked SOD to fire intensity, and firefighters reported that fires were burning more fiercely in areas with evidence of SOD. So when Metz and her colleagues analyzed their data, they thought they’d see that fires were more severe in plots infested with SOD. But that is not what they found. Their data showed that plots with and without SOD showed no difference in fire severity. They quantified fire severity using something called the Composite Burn Index. It takes into account the effects of fire on the ground, as well as in the shrubs and trees. Composite Burn Index did not differ between plots infested with SOD and plots without SOD. The popular assumption, that SOD makes wildfires burn more intensely, was wrong. Dead tanoak along the Big Sur Highway. Photo: Karl Buermeyer, COMTF. However, Metz and the team could dig deeper into their data. From their pre-fire data, they knew whether SOD had infested the plots recently, or whether SOD had been there for some time. It can take several years for a tree to die from SOD. When trees are first infected with SOD and die, their leaves turn dry and brown, and they remain on the tree for a year or more. Later, the branches fall to the ground, and eventually the whole trunk falls over. The fuel created by newly infected trees and trees that have been infected for several years is quite different. Metz and her colleagues found that in plots that were newly infested, plots with more dead biomass (or fuel) burned more intensely. In plots that were infested some time ago, the amount of biomass was not related to the intensity of the fire. They suspect that crisp brown leaves on newly infected trees allow the fire to burn high in the canopy. 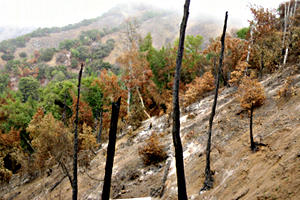 In plots infested long ago, the dead trees are on the ground; in this case, the fire damages the soil and the tree roots, which makes slopes vulnerable to erosion from mudslides. The conventional wisdom about SOD and fire was not quite right, but there was some truth to it—it just depends on when the forest was infested with SOD. Newly infested forests burn with more intensity than un-infested forests or forests that were infested some time ago. It has been almost three years since the Basin Complex Fire burned up Metz’s plots. Now, she and her colleagues are looking to see how the forest recovers—from the fire, and from SOD. Maia Beh, a grad student in the Rizzo Lab, found that of the plots that had SOD in the pre-fire surveys, only 20% still have it today. They’re not sure whether it’s because of the fire, or because there have been two years of drought. The pathogen, P. ramorum, is dependent on water, and doesn’t do well in drought conditions. They’re looking at plots that did not burn up in the fire to see whether the decline in the pathogen is due to drought, fire, or some combination of the two. Though the incidence of the pathogen has declined on land, it is still present in almost all the watersheds in the area. And, last year we had late rains, extending through spring into the early summer. Late rains with warm temperatures create conditions that are ideal for the pathogen, says Metz. With continued careful sampling of those 280 plots—and maybe a few more unintended natural experiments—Metz and her colleagues will learn how forests recover from both fire and SOD. To prevent the spread of the pathogen P. ramorum, take steps make sure it isn’t hitchhiking on your boots. Clean your boots into the buckets of diluted bleach that you might find at trailheads, or spray your boots down with Lysol. Take part in a SOD-blitz, a citizen science project. Learn more about SOD and help figure out where the pathogen has spread, with UC Berkeley plant pathologist Matteo Garbolotto. You can see Garbolotto on the QUEST video Plant Plague: Sudden Oak Death. Jennifer, thanks for highlighting the complexity of the sudden oak death-fire interaction. Simultaneous with the Rizzo Lab’s work on the Basin Complex fires, several other groups of collaborators have also been measuring other aspects of this interaction, such as trying to quantify just how much the disease may add to the fuels lying on the forest floor (dead stems and branches) and to the fuels in the forest canopy (dead leaves). Additionally, a group of us conducted interviews with the personnel who worked on the Basin Complex fires. What we’re learning from all this research is that wildfire is a very complex phenomenon (no big surprise). As you point out, Margaret Metz’s analysis uncovered the complexity of fire effects on various components of the forest ecosystem. Wildfire has similarly complex effects on social and economic spheres, and its effects vary from place to place on the landscape. To take one example, fire behavior analysts on the northern end of the Basin Complex observed different relationships between tree mortality and subsequent fire behavior than analysts on the southern end. As another example, even if the fire was not severe enough to damage soil or kill many trees in a particular area, increased numbers of dead branches and stems on the ground may have generated flame lengths that were high enough to convince firefighters that they needed to back off to the next ridge and set a backing fire rather than attacking the fire directly. This has implications for the ultimate cost of the suppression action and numbers of acres that eventually get burned. It is a very complicated story that will take lots of study to begin to make sense of. Margaret’s analysis is a careful one that rightly acknowledges this complexity. Thanks for covering it! Thanks for your comments! Wildfires are definitely complex. In talking with Margaret, I began to understand how exciting – and difficult – it is to study fires, and their effects. The vocabulary used to describe fires is so specific; for instance, intensity is the height of the flames and other physical characteristics of the fire, and severity is the damage the done by the fire. I should not be surprised by how much we know (and don’t know) about the mechanics of fire, but writing this post definitely opened my eyes to fire science!